What Aroused our Curiosity At Exhibitor Live? Earlier this year, Exhibitor Live (one of the biggest trade shows in the world for corporate event marketing) provided us with an array of innovative, interactive booth displays. Here are Lee Ali’s (founder of Expo Stars) top picks from the renowned trade show: designs and ideas fuelled by cutting-edge tech that are revolutionising face-to-face marketing as we know it. Sometimes attending a trade show is a little like stepping into the world of Alice in Wonderland. Around every corner are intriguing booths and interactive displays that beg further exploration. My curiosity was peaked by G-SMATT’s interactive glass display. They used their own product at Exhibitor Live to create a stunning and immersive experience for their booth visitors. Their product is created from commercial grade transparent glass combined with micro-LED lighting and media content. Using this material businesses can project live images onto their G-Glass canvas to deliver their messaging in mesmerising ways. Prospects can also interact with the live projections through motion and sound, helping the business engage with potential customers and really deliver that ‘wow’ factor. G-SMATT’s display effectively strengthened the brand’s image while showcasing their quality product. This demonstrated how technology, when used intelligently, can fuel jaw-dropping experiences to enhance face-to-face engagement and performance. Engage Balloons are masters of attendee interaction. The company offers exhibitors a unique way to engage with prospects while providing businesses with valuable metrics to help them measure success. I was blown away by the ingenuity of their display at Exhibitor Live. They used monitors installed with augmented reality technology to feedback images of attendees in real time. At the top of the monitor was a header featuring a question for attendees. 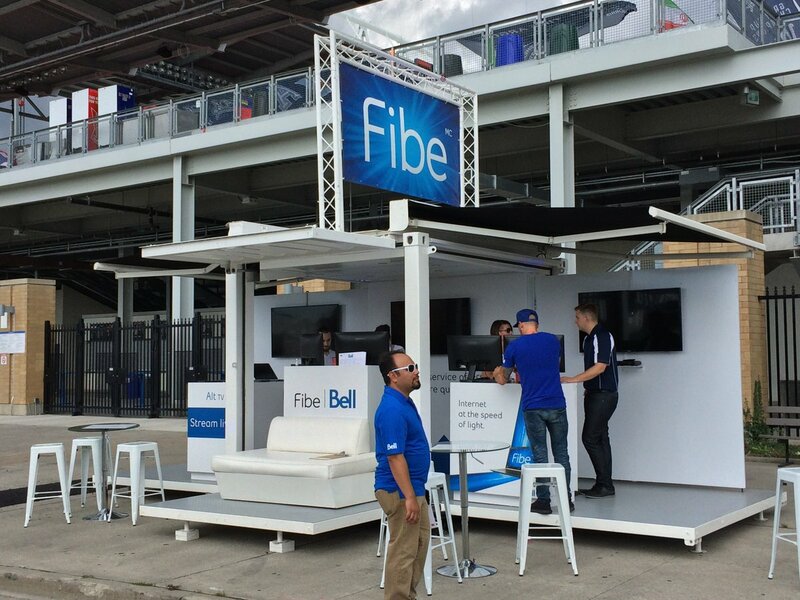 For example, one heading asked: “Why does your agency shy away from trade show marketing?”. Because the business has complete control over the content they can create messages aligned to their marketing. 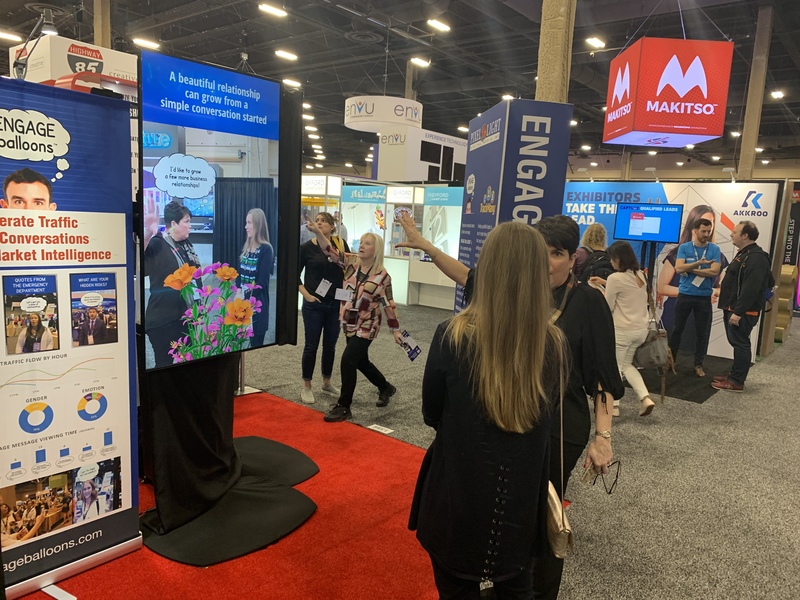 Not only is this a fun way to start conversations with attendees but it’s highly-effective at broadcasting the business’ value in a non-invasive way. On top of this, the product can capture valuable metrics, from traffic flow by hour to visitor demographics. This gives businesses crucial insight into their performance so they can learn from their trade show experience and progress. When people think of recycled materials, they don’t expect to see a high-end, stunning product. But that’s exactly what Loki Box Design has achieved. 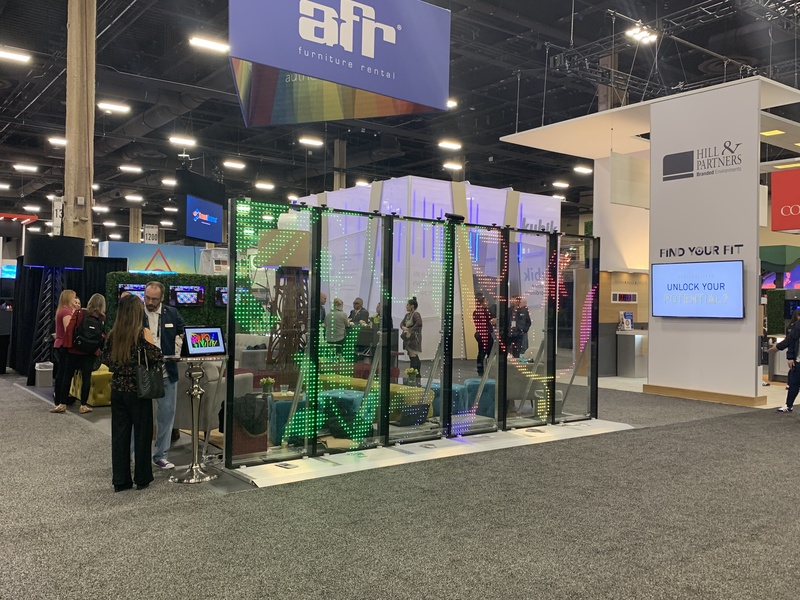 The company displayed one of its products at Exhibitor Live – a mobile architectural exhibit converted from an old shipping container – and it was beautiful. Loki Box is sublime at creating attractive and attention-grabbing designs that encourage reams of people to explore their work at exhibitions. The company also helps its customers through experimental marketing, turning their mobile structures into interactive experiences that dazzle attendees and drive sales. I loved how Loki Box Designs are made entirely out of recycled materials. It shows that the business cares about reducing its impact on the environment which does wonderful things for the brand. Plus, it gets other exhibiting businesses to think about their own environmental impact. Considering how we can make our products and workspaces more eco-friendly is critical – the future of the planet depends on it, after all! Have these displays inspired you? Done well and they can be a compelling booth feature that benefits your business in countless ways. For further insight from exhibiting experts who attended Exhibitor Live, check out our recent blog. Have you recently seen an exhibition display that knocked your socks off? We’d love to hear more – send us your stories on Twitter!